Last month I wrote about the 5 most significant cars of the 1970s decade. One of the reasons for the success of 3 of the cars on the list was their small size. Gasoline prices had really taken a massive uptick during the 1970s, and the EPA’s Corporate Average Fuel Economy (CAFE) standards had come into full swing by the late-1970s. All of this meant big cars and large displacement engines were on their way out. By the 1980s, for cars large displacement V8 engines were all gone and the few big cars that remained, they were holding on to the cliff to avoid extinction only by their fingernails using much smaller displacement engines. For American automakers, never was there such a massive shift in direction than during the 1980s. They were forced to remake themselves during the 1980s decade. Even with the monumental changes in the automobile industry that occurred during the 1980s, there would be some cars that would change the way we drove and even the way we thought. Here’s a list of the 5 most significant cars of the Atari, legwarmers, Pac-Man, the mullet, and the Rubik’s Cube decade. Pontiac had tried the concept in the 1970s with the 4-door version of the Grand Am – providing a zippy motor and an European tuned sports suspension in a sporty looking 4-door car. However buyers just weren’t ready for this kind of car at that time. They still longed for sporty and stylish larger 2-door cars, their vision was warped with the thought that a 4-door car was practical and never considered sporty. The times had changed when the 1980s rolled in, and Americans were now becoming accustomed to smaller cars. So Pontiac released a lightweight sporty European inspired 4-door called the 6000 Special Touring Edition (STE). Suddenly attitudes changed and it became hip to be seen in a 4-door as long as it was sporty like the 6000 STE. The STE was the 1980s equivalent of the release of 1964 Pontiac GTO, in that after its release the competitors hit the scene – just about every automaker then began offering a sporty 4-door sedan with a European tuned suspension. The Pontiac 6000 which had been released in 1982 replaced the Pontiac Lemans. The 6000 was a revolution rather than an evolution. Whereas the GM A-body Lemans had been rear wheel drive with a standard V6 and an optional V8, the new 6000 was substantially lighter in weight and used front-wheel drive architecture. The 1982 6000 came standard with a 92 horsepower fuel injected Iron Duke 2.5 liter 4-cylinder which yielded around 40 mpg on the highway. What Pontiac did with the introduction of the STE for 1983 was add a finely tuned sports suspension, a 135 horsepower 2-bbl 2.8 liter HO V6, sporty European inspired exterior treatments, and a European inspired interior which had a standard center console automatic shifter. A futuristic gauge cluster which included a digital speedo, tachometer, and other gauges was standard with the STE. Also standard with the STE was a performance tuned exhaust. With all this in mind it was no surprise that the 6000 STE made Car and Driver magazine’s coveted Ten Best Cars list for 1983 (it would make the list 2 more times after 1983). Pontiac may have lost its last in-house V8s (the Pontiac 265 and 301 CID V8s) at the end of the 1981 model, year but with the 6000 STE all was forgotten since the STE reaffirmed Pontiac’s claim as GM’s performance division – the "We Build Excitement" was Pontiac new slogan for the 1980s. STE performance was brisk, 0-60 mph took a little over 10 seconds which was very quick by 1983 standards. Stopping was also snappy with the STE’s standard 4-wheel disc brakes. And handling was among the best in the world for a 4-door sedan back in 1983. Pontiac replaced the 2-bbl with fuel injection for 1985 and output increased to 140 horsepower. A few years later a 135 horsepower 3.1 liter V6 would replace the 2.8. And a state-of-the-art all-wheel drive (AWD) system was made standard on the 1989 STE. Unfortunately Pontiac pulled the plug on the STE when the 1989 model year production was completed. The Pontiac 6000 stayed around for another two model years and was then cancelled. Unfortunately Pontiac had failed to continue to increase horsepower and left the STE’s interior and exterior untouched allowing the competition to catchup and then surpass it. Another problem was Pontiac never offered anything more than a 3-speed automatic with the STE – a 4-speed automatic should have been standard and a 5-speed manual transmission should have been optional. Never-the-less the 6000 STE changed American buyers’ perceptions, it was the first mass produced sporty 4-door sedan that made driving a 4-door sedan cool. Now many performance car fans prefer a 4-door performance car to a 2-door performance car, this never would have happened had it not been for the 6000 STE. 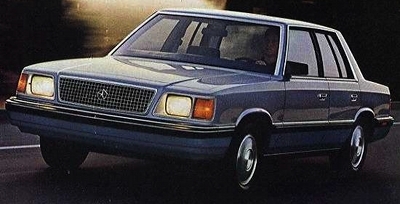 When the 1980s decade rolled in, no automaker was in worse straights than Chrysler. The skyrocketing gasoline prices and the EPA’s Corporate Average Fuel Economy (CAFE) standards along with quality control issues had really taken their toll on the ailing Chrysler Corporation. However Chrysler had a new man at the helm, Lee Iacocca, the man responsible for the release of the wildly successful 1964 1/2 Ford Mustang. Iacocca had a big plan to revamp the entire Chrysler, Dodge, and Plymouth lineup which included the movement of almost every offering to front-wheel drive. It was a bold move, but Chrysler had to have some strategy to pull itself out from the abyss and pay back the U.S. Government loans it received to keep afloat. 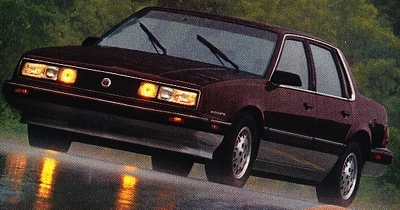 The K-car was Chrysler’s version of Ford’s Fox body platform, except a majority of Chrysler’s cars during the 1980s would be based on the K-car platform (most of Chrysler’s other platforms during the 1980s were variants of the K-platform). In other words Iacocca gambled the Chrysler Corporation’s future on the K-car platform. Fortunately for Chrysler, Iacocca’s gamble not only paid off, but paid off very big. Within a short period of time Chrysler was able to pay off all the Government loans, and funnel money back into the company for the development of future products. And by 1988 Chrysler purchased AMC in order to get its Jeep division. This would prove to be the deal of the century, when SUVs skyrocketing in popularity Chrysler’s Jeep division led the pack, and Chrysler raked in the profits. None of this would have ever happened without the K-car. The K-car proved to the American public that a extremely affordable and reliable car could be built in America. And buyers agreed, with first year 1981 production of 155,781 units for the Aries car was almost double of the 85,469 total production for the 1980 Dodge Aspen (the car the Aries car replaced). Sales would continue to be strong even in the Aries last model year, 1988 where it still managed to sell over 100,000 units. And that was only part of the story Chrysler also had a Plymouth variant of the K-car which was called the Reliant. The Reliant sold 151,637 units for 1981, making total Aries and Reliant production for their first year well over 300,000 units. The Reliant’s last production year was also 1988 where it also managed over 100,000 sales. The main factors of the Aries and Reliant success were they were offered in 2-door, 4-door, and 5-door wagon configurations; they had different trim levels from base to more luxury oriented; and they provided comfortable seating for 6 adults. The K-car may have been small in stature but with its front-wheel drive configuration and overall boxy shape it provided occupants with lots of leg room, head room, and elbow space. For a base price of just under $6,000 for both the Aries and Reliant in 1981, buyers felt they were getting a lot for the money. In fact both cars may have looked like compact cars on the outside but were classified by the EPA as mid-sized cars due to their spacious interior dimensions. And trunk space was also a very generous 15 cubic feet, more than enough to fit several large suitcases. The K-car also changed the way Chrysler thought, it shared so many parts among the K-cars along with other Chrysler offerings. Worth noting Chrysler also produced a K-car version for its Chrysler division called the Lebaron from 1982-1988 which though not as popular as the Aries or Reliant, still sold very well. Chrysler also produced the Dodge 400 another K-car model offering for the 1982 and 1983 model years which had more modest sales. The Dodge 400 and Chrysler Lebaron were marketed as upscale cars with more available amenities and luxury options than the Aries and Reliant. And as previously mentioned other Chrysler Corporation cars at the time like its minivans used a modified K-car platform and K-car parts which saved Chrysler millions of dollars in development costs. The K-car since it was sold to the public as a fuel efficient car, only offered a few different 4-cylinder engines (which ranged from 2.2 to 2.6 liters in displacement) – a V6 was never an option on the Aries or Reliant. As a side note, for 1981 "HEMI" badges could be found on the Aries and Reliant when equipped with the optional 2.6 liter 4-cylinder (a Mitsubishi sourced SOHC engine with hemispherical heads). Before you get too excited or comb the classified ads looking for a Hemi K-car, this motor produced a meager 92 horsepower which was only 8 horsepower more than the base SOHC 2.2 liter 4-cylinder available that same year. A lot of horsepower really wasn’t needed since the base curb weight of these two cars was an extremely light 2,300 lbs. And with the high gasoline prices at the time most buyers didn’t care about horsepower. They were more focused on the K-car’s fantastic highway gas mileage rating of 41mpg (and this was back when most cars struggled to get over 20 mpg on the highway). Before you spit out the cup of coffee you are drinking or shake your fist while reading this article, yes, you read correctly, the Fiero has made the list. The Fiero today has a tainted image, with only the GT and Formula models escaping the tarnished Fiero reputation. Most people think of the Fiero as a failed car – a sort of Edsel of the 1980s. And they would be partially correct. The Fiero left in disgrace after GM pulled the plug in the middle of the 1988 model year. A massive sales slide for 1988 was the main reason why GM pulled the plug. The sad aspect of this story is that Pontiac had a new redesigned Fiero in the works for 1989 which would have had sleeker lines and more power engine offerings which surely would have rejuvenated sales. The Fiero didn’t make this list because of its premature exit, but due to its grand entrance. You have to understand the times surrounding the early-1980s. Performance cars were mostly gone, and stoggy fuel efficient cars were the mainstay. If you found something sporty it usually was a small underpowered 4-cylinder car with a decal package and spoilers. And those yearning for a true performance car were flocking to the rear-wheel drive and V8 powered Chevrolet Corvette, Chevrolet Camaro Z28, Pontiac Trans Am, and Ford Mustang GT. For many these cars weren’t an option – they were too expensive and were heavy gas drinkers. For the average person who wanted an exotic 2-seat sports car for a reasonable price there really wasn’t anything out there to buy. Well, Pontiac had just the ticket it devised a strategy to release a reasonably priced sports car on GM all-new P-car platform. Pontiac could have taken the easy road and just made the Fiero a smaller version of the Corvette – a rear-wheel drive front engined 2-seat sports car. It elected not to do so, instead it opted for an exotic sports car configuration that consisted of a mid-engine layout with rear-wheel drive. Of course the Fiero wasn’t the first budget sports car with this type of configuration – the Porsche 914 and Fiat X1/9 both had this setup long before the Fiero. However both of these cars had very poor sales and had reliability issues. The Fiero was different it was the first 2-seat sports car to sell in massive numbers – 136,840 units were sold for 1984 (its first year). As a comparison the 1984 Chevrolet Corvette which was all-new throughout except for the V8 engine under the hood. saw its best year in sales with 51,547 produced for that model year. However the Corvette had the luxury of hitting the dealership lots back in March of 1983 and had a full year and half of production verses the almost 12 month 1984 Fiero production year. When the 1984 Corvette was released, it was immediately the darling of the automobile press. But that changed in a few short months when in Fall of 1984, all attention shifted to Pontiac’s all new 2-seater. The Fiero was the new darling of the auto press. And buyers couldn’t wait to get their hands on one. It had exotic lines like an sleek Italian sports car, a very attractive interior with driver oriented instrumentation, and it was built on a platform not shared with any other GM car. Add to this, it had state-of-the-art EnduraFlex plastic panels mounted to a steel skeletal infrastructure. This had four benefits. First was the Fiero exterior was ding and dent proof, when hit the panels would bend inward and absorb the shock and revert back to their previously shape. In other words those parking lot door dings were a thing of the past with the Fiero. The second benefit was the EnduraFlex panels didn’t rust. Third the Fiero was much safer than most sports cars its size, the steel infrastructure acted like a cage which protected occupants during a collision. And last was these exterior panels could easily be removed and replaced with different shaped panels. Pontiac did this so it could do future major exterior restyling by just adding new panels which made styling changes more cost effective than a conventional car. After market companies soon caught on to this, and the Fiero has become the number one car for body panel conversions. These conversion companies have added panels to clone different Ferrari and Lamborghini models or to make their own unique exotic sports car. This trend is still popular today, it’s one of the reasons why good conditioned unaltered Fieros are getting harder to find these days. Duraflex body panels were later used on some Saturn models and even GM’s 4th generation Camaro, Firebird, and Trans Am. The 1984 Fiero had an ultra-low base price of $7,999 which included standard both 4-wheel disc brakes and a 4-wheel independent suspension. How could you go wrong? The problem was GM brass were so terrified that the Fiero was going to cut into Corvette sales that it forced Pontiac to market it initially as a 4-cylinder commuter car hence it used off the shelf suspension pieces and gearboxes from other GM economy cars. The Fiero would eventually get a performance-oriented 140 horsepower V6 in 1985 and a world class Lotus tuned suspension in 1988, unfortunately it was a little too late. Unfortunately now the Fiero is only remembered for the safety recall due to engine fires and the massive downturn in sales towards the end of its production cycle. However the fact remains that the Fiero was still one of the most significant cars of the Atari decade since it proved for the first time that a 2-seat sports car could obtain sales over 100,000 units. GM surely would love to have another 2-seat sports car with such high production numbers. The much loved 2-seat 2007-2010 Pontiac Solstice had the same five year run as the Fiero and only sold a total of 65,724 units versus the 370,168 1984-1988 Fiero production total. 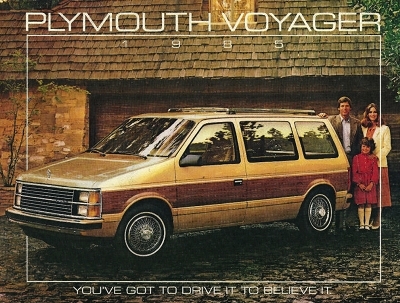 How can you talk about the 1980s automobile industry and not mention the Dodge Caravan and Plymouth Voyager? It’s impossible. These two vehicles revolutionized the automobile industry – they created the minivan market. As the story goes, when Lee Iacocca was still at Ford some innovative engineers came up with the minivan concept – a smaller van that could easily fit in a standard size garage. Henry Ford II initially had enthusiasm for this minivan but wouldn’t bless it for production due to the recession of 1974. Lee Iacocca later took the ideal to Chrysler which built first mass produced front-wheel drive minivan for the U.S. market (the first production front-wheel drive small van was the DKW Schnellaster which never was available in the U.S). The Caravan and Voyager both used Chrysler’s new S-platform which was a modified K-car platform. The launch was perfect timing. Most American cars had severely shrunken in size, only a few full-size cars remained by the early-1980s. So buyers had to make do with less interior and cargo/trunk space. The cornerstone of family transportation after WWII, the full-size station wagon, was by the early-1980s on borrowed time and fading fast. With the Caravan and Voyager no longer would car buyers have to make do with less, they could have the efficiency of a smaller car yet the roominess of a full-size station wagon and the cargo capacity of a large utility vehicle [http://www.youtube.com/watch?v=os3pNDM9YxI]. Seating capacity allowed up to 7 passengers. 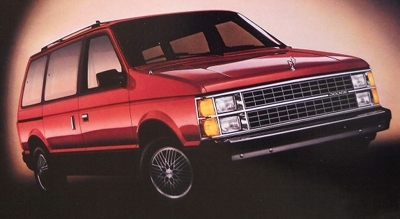 The Caravan and Voyager which were both released in late-1983 to the buying public as 1984 model year offerings, had a low flat floor due to the front-wheel drive configuration making it easy to get in and out of the van and allowed more cargo capacity. Not to mention the low floor heigh made it easy to load up the van with large pieces of plywood and other construction supplies when the seats were removed. Dodge even offered a cargo version of the Caravan called the Mini Ram Van which was a utility version with only two front seats. And even with all this capacity, the Caravan and Voyager were small enough to fit into a standard size garage. The Caravan and Voyager also shared some common parts with the K-car platform. Starting in 1984, both minivans used the K-car’s 2.2 and 2.6 liter 4-cylinders that produced 96 and 104 horsepower (119 lb-ft and 142 lb-ft) respectively. A few years later a 2.5 liter 4-cylinder wo uld be offered. By 1989 a fuel-injected 150 horsepower (180 lb-ft of torque) turbo version of the 2.5 liter was also on the option list. 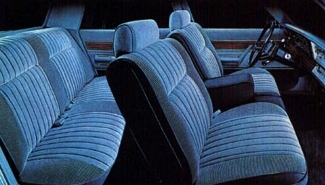 As Caravan and Voyager production soared during the 1980s and new competition started popping up, Chrysler began offering a V6 on the option list starting in 1987. Even though the Caravan and Voyager used boxy styling, it was very attractive and appealed to many buyers. And usually with boxy vehicles gas mileage suffers however not with these two minivans, they easily managed when equipped with the 2.2 liter 4-cylinder, 26 mpg on the highway which back in the day was impressive gas mileage for a utility vehicle. And just in case this didn’t lure buyers, Chrysler offered a 5 year or 50,000 mile warranty with the Caravan and Voyager which put buyers fears to rest concerning reliability. The Caravan and Voyager would grow in popularity during the 1980s and 1990s. Eventually Chrysler would release an upscale minivan for sale at Chrysler dealerships called the Town and County. For many years Chrysler with its line of minivans ruled its market segment and continued to be the minivan trendsetter for many years. Though in recent years minivan sales have cooled due to buyers shifting to SUVs and SUV crossovers, the Dodge Caravan, Chrysler Voyager (the Plymouth division bit the dust several years ago), and Chrysler Town & Country still lead the minivan market in sales. Jeep doesn’t just build 4-wheel drive (4WD) vehicles, it builds icons. Many of Jeeps vehicles including the full-size Wagoneer/Grand Wagoneer, CJ series, and Wrangler have become legends. However the most revered modern Jeep icon is the 1984-2001 Cherokee. 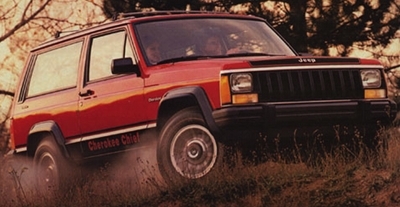 When the 1984 Cherokee was first released it started the modern SUV craze. It presented to buyers 100% utility, off-road prowess, and fuel efficiency in a sweet on the eyes compact SUV. The 1984 Cherokee which was built on the XJ platform was AMC’s hope for the future. AMC car sales had taken a real beating during the 1970s. By the early 1980s, they wrapped their future survival into a partnership with Renault, which offered to the table smaller efficient cars and some capital to help with future development costs. The only bright spot for AMC during the 1970s and 1980s was its Jeep division. Jeep sales were steadily increasing. Instead of resting on its laurels AMC spent a lot of money into the development of the XJ Cherokee and its more upscale brother the XJ Wagoneer. In the early 1980s this seemed like a big gamble but one that paid off handily. The XJ Cherokee replaced the full-size SJ Cherokee which had carved out a nice niche since its 1974 model year introduction. Sales had reached as high as 39,183 units in 1979 and had dropped to 6,186 units in 1983. With the new XJ Cherokee and Wagoneer sales jumped to 93,326 units for 1984, giving AMC plenty of capital to spend on a CJ replacement – the Jeep Wrangler which arrived for the 1987 model year. A majority of these 1984 XJ sales were Cherokees, the Wagoneer which had mandatory simulated wood exterior panels and an upscale interior would see much lower sales and be more of a low production speciality SUV. Total XJ sales continued to climb throughout the 1980s and into the 1990s. Jeep would pull the plug on the XJ Wagoneer at the end of the 1990 model year. By this time XJ Wagoneer sales were so insignificant since a high-end luxury version of the Cherokee had been introduced in 1987 called the Limited. Cherokee sales continued to be strong and reached an apex of 286,463 units for the 1996 model year. Even with 18 model years of production in which the Cherokee only had a mild exterior and interior update, Cherokee sales were still strong at 120,454 units for 2001 (its last year of production). Total XJ sales were 2,884,172 during these 18 model years. The XJ Cherokee is so loved by many, that Jeep could revived the 2001 Cherokee model (with no changes) and it would sell very well even here in 2013. With the upcoming all-new 2014 (KL platform) Cherokee due to be released shortly, Jeep is hoping to recapture the mega high sales figures and mystic of the old XJ Cherokee. The explosive popularity of the Cherokee led to the release of the bigger ZJ Grand Cherokee for the 1993 model year which initially was supposed to replace the Cherokee. Even though the 1993-1998 ZJ Grand Cherokee was a hot seller in its own right (1,251,473 were sold), buyers kept buying the old XJ Cherokee so it remained alive longer than Jeep would have ever expected and was eventually replaced by the KJ Liberty in 2002. GM and Ford to its credit saw the emerging SUV market and offered, starting in the early 1980s, the more compact S10 Blazer and Bronco II respectively. However GM and Ford handicapped sales by only offering these two in a 3-door model (the 3rd door was the rear hatch). The Cherokee on the other hand offered both a 3-door model along with a 5-door model. It became quite apparent that soon into the XJ Cherokee production run, the 5-door was the more popular model, eventually during the mid-1990s Jeep pulled the plug on the 3-door model. The Cherokee was originally offered with AMC’s reliable 105 horsepower (132 lb-ft of torque) 2.5 liter 4-cylinder as standard with GM’s 115 horsepower (145 lb-ft of torque) 2.8 liter V6 as optional. After a few years the 2.5 liter received TBI fuel-injection and output increased to 117 horsepower (135 lb-ft of torque). Soon thereafter a port fuel injection system was introduced which increased the 2.5 liter’s output to 130 horsepower (139 lb-ft of torque). For 1985 to 1987 a Renault sourced 2.1 liter 4-cylinder turbo diesel was also on the option list (an Italian sourced turbo-diesel was also offered for many years in non-US spec XJ Cherokees). However the fun began when in 1987 the GM 2.8 was replaced with an all-new port injected 4.0 liter inline-6 that produced from 177 to 190 horsepower (220 to 225 lb-ft of torque) which made it at that time the most powerful SUV in its class. Add to that, the Cherokee during its long run was one of the most capable off-road SUVs at that time. The XJ Cherokee also handled well for its day and with its compact size, easily fit in tight parking spots and smaller garages. The Cherokee though more rugged than its competition had a more civilized ride – it drove more like a car versus the typical SUV back then which rode like a pickup truck. The XJ used a state-of-the-art stiff monocoque body structure instead of the typical outdated body-on-frame structure which all its competitors back in the day used. There’s also another reason why the XJ Cherokee was so significant in the 1980s, it made Jeep sales skyrocket which made the Jeep division very attractive to Chrysler which eventually bought AMC in order to obtain Jeep. Under Chrysler’s leadership, Jeep continued to flourish. Had it not been for the XJ Cherokee, AMC may have died and Jeep might have gone with it.